1. Richland College is a smoke- and tobacco-free campus, except as permitted in the “five designated areas.” In addition, the sale of tobacco products on campus is prohibited. 2. The five designated areas are: Fannin Hall on the east side near the Arena Theater exit; Medina Hall, immediately north of the east exit: Uvalde Building on the south side; Thunderduck Hall, immediately southwest of west entrance; and Crockett Hall on the northwest corner. 3. Ash tray urns displaying appropriate signs are placed on the inside perimeter of all parking lots, reminding students, staff, and community visitors that Richland is a smoke-free/tobacco-free campus except in the five designated locations. 4. 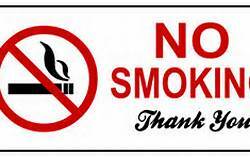 In compliance with National Junior College Athletic Association and Chamber Classic Soccer Alliance, Inc. policies and regulations, tobacco use is prohibited from all athletic fields on the Richland campus. 5. Richland College Police may issue citations for violations of smoking/tobacco use regulations promulgated by Richland College. 6. The twelve month “year” regarding citations begins on August 1 and ends on July 31 of each calendar year. 7. All paid citations will be purged from the system on August 1 of each year. 1st citation - $5; 2nd citation - $15; 3rd citation - $20; 4th citation - $25; 5th citation and beyond - $30. 9. Citation fees will progress through the fee schedule and include all other citations on file with the College Police department. A person may return to the lower fee structure on August 1 of each year if all previous fees for citations on file with the College Police department have been paid. 10. After the second citation has been issued and remains unpaid, a block will be placed on a student’s record. A Richland College/DCCCD faculty and staff member’s supervisor will be notified of issued and unpaid citations. c. Within ten (10) days after the date of the violation, submit the form to the Vice President for Student Development.